Fluxx gets the Science Fiction treatment. From the publisher: “Just when you thought that Fluxx had gone as far as it could go – it blasts off for the Stars! Explore the vastness of space-themed humor with your valiant Captain, Engineer, and, of course, your Expendable Crewman. Go check out that Small Moon – or is it really a Space Station? 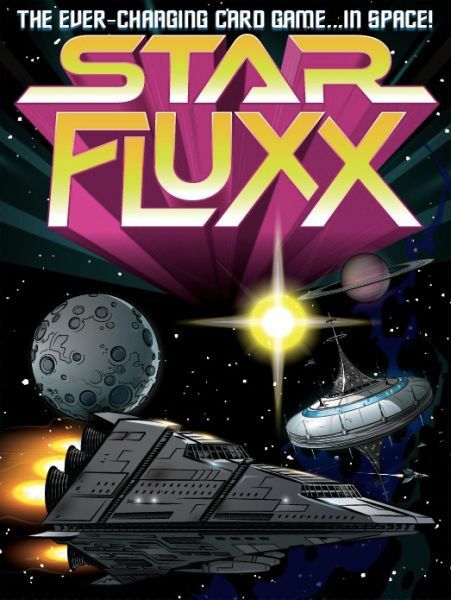 You may be swayed by Unseen Forces, held hostage by Evil Computers, or find your ship infested with Cute Fuzzy Aliens.” Like its brethren, Star Fluxx is the game of ever changing rules. It starts out as Draw 1, Play 1, but even that can change. When a Goal card is played, you can win by meeting the Goal, usually by having the correct Keeper cards in front of you. Action and Surprise cards help you to meet the Goal, or stop your opponent. Creeper cards usually prevent you from winning, but are sometimes necessary to meet the Goal.